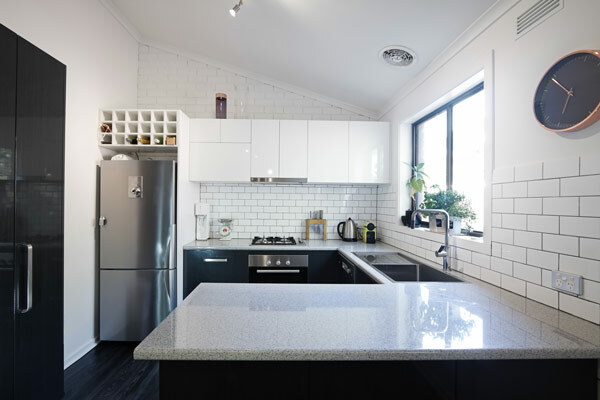 DIY: How to Install a Subway Tile Backsplash - GNH Lumber Co. DIY: How to Install a Subway Tile Backsplash - GNH Lumber Co.
Cover the surrounding area to protect adjacent surfaces. Begin by applying the thin-set adhesive or mastic to the wall using a notched trowel while tilted at about a 45-degree angle, moving in the same direction. Use a thinner notch with this adhesive so you don’t have build-up and unevenness behind the tile itself. Create consistent ridges of the adhesive on the wall. Only apply as much adhesive as you can cover in 10 or 15 minutes. Smooth over or knock down the thin-set to get rid of the comb marks. Otherwise, you’ll see the comb marks through the tile. The trick is to do this without changing the depth of the thin-set on the wall. Use spacers to make sure the tiles are set in a uniform pattern. Set the tile into the adhesive. Install any border tile first, then position the sheets of subway tile on the wall next to the border. Align your outer lower tile flush with the edge of the countertop and press into the mastic. Work horizontally, placing your second tile next to your first and adding 2 tile spacers in between them. Clean out any mastic that was squeezed in between the tile (a toothpick or a knife will work). This will make it easier for you in the long-run. Once you are done with the first row, you’ll start on the second row. Remember, you’re installing subway tile so you’ll want them to be staggered. You can cut your tiles in half using your tile saw. When you’re working around an obstacle such as an outlet, measure the distance between the electrical outlet and the last laid tile. Subtract the length of your space (most likely 1/8 of an inch), and then mark a tile for cutting. Cut the tile along your marked line. A tile wet saw makes this project much quicker and easier with better results than other tile cutting methods. You’ll want your tile to be hidden under the switch plates, so make your tile as close the electrical outlet as you can. Use a level to make sure you’re on track and tiling in a straight line. Once the tiles are installed, let the mastic set up overnight. Once the mastic has dried completely, remove the tile spacers. It’s now time to add the grout! Tape off any edges you don’t want grout to go, including cabinets, outlets and walls. Mix the grout according to the package. The consistency should be similar to peanut butter. Using a tile float, apply the grout to the backsplash. Use the same 45-degree angle to work the grout into all the crevices. Work in 2-feet to 3-feet spaces. When you spread the grout on with the float, you’ll want to apply pressure into the tile spaces themselves so you are squeezing the grout completely into the spaces to prevent cracking and flaking over time. Run the grout line in multiple directions. Once you have applied the grout to the tile spaces, it’s time to sponge off the grout from the tile themselves. Wet the sponge with water and ring out most of the water. Begin wiping down the grout with the sponge. It’s a messy job, so you’re going to have to ring out the sponge quite a few times. Get the tiles mostly cleaned of grout and then let it sit. Once the gout has dried completely, you’ll be able to totally clean the tiles. Make sure you let it sit before completely wiping off the grout or else you will begin to pull the grout out of the tile spaces! Use the terry cloth side of your sponge for your final wipe-down before allowing the grout to dry completely. You’ll want to wipe down your grout about 5 times before letting it dry completely. Now that you’re done, step back and admire your hard work! Allow at least four hours for the grout to cure. Congratulations! You’re an expert at installing subway tiles! Now get to work and make your kitchen or bathroom look gorgeous. For help with your kitchen and bath redesign, the team at GNH can help you get started on the path to that one-of-a-kind kitchen or bath! We are here to assist with everything from conceptualization to final layout, from browsing style options to choosing the right materials and brands, from in-home measurements and consultations all the way through to the final installation. To help re-imagine your kitchen layout, download our FREE Kitchen Layout Guide.